Gabe Pacyniak teaches primarily in the natural resources and environmental law clinic. The clinic provides law and policy representation to low-income and underserved communities on a broad range of issues. In addition to his work in the clinic, Gabe’s teaching, scholarship, and policy work focuses on climate change and energy issues. He will be teaching an energy and climate change course in spring 2018. 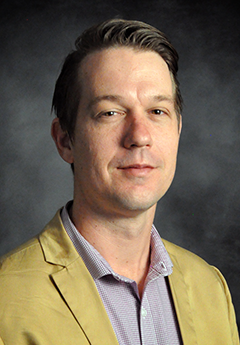 Prior to joining the UNM faculty in August 2017, Gabe managed the climate change mitigation program at the Georgetown Climate Center and co-taught a climate change law and policy practicum course as an adjunct professor at Georgetown Law. At the Georgetown Climate Center, he led work to support states in advancing greenhouse gas (GHG) reduction and clean energy policies in the power and transportation sectors. In the power sector, this included informing and facilitating state input on the federal Clean Power Plan and on state energy policies. In the transportation sector, this included facilitating the Transportation and Climate Initiative, an effort by northeast and mid-Atlantic states to reduce greenhouse gas emissions from transportation through collaboration on electric vehicle policies and by exploring regional market-based policies and other measures. Gabe is a graduate of Georgetown Law and the New College of Florida. While in law school, he interned at the White House Office of Energy and Climate Change and on the staff of the U.S. House of Representatives Energy and Commerce Committee while the committee was drafting comprehensive climate change litigation. Prior to becoming a lawyer, Gabe worked as a community journalist in Washington, D.C. Please see instructor for course description. New New Mexico’s Renewable Portfolio Standard: Analysis of Existing Policy Design Elements and Compliance Obligations Beyond 2020, WHITE PAPER (2018). Making the Most of Cooperative Federalism: What the Clean Power Plan has Already Achieved, 29 GEO. ENVTL. L. REV. 301 (2017). New Strategies for Reducing Transportation Emissions and Preparing for Climate Impacts, 44 FORDHAM URB. L.J. 919 (2017) (co-authored with Vicki Arroyo and Kathryn A. Zyla). State Innovation on Climate Change: Reducing Emissions from Key Sectors, While Preparing for a “New Normal,” 10 HARV. L. & POL'Y REV. 385 (2016) (co-authored with Vicki Arroyo, Kathryn A. Zyla, and Melissa Deas). Controversy Reemerges Over Hiring, Review of Immigration Judges, 22 GEO. IMMIGR. L J. 805 (2008). An Examination of Policy Options for Achieving Greenhouse Gas Emissions Reductions in New Jersey, Georgetown Climate Center, Rutgers University and World Resources Institute (2017) (lead author). Reducing Transportation Emissions in the Northeast and Mid-Atlantic: Fuel System Considerations, Georgetown Climate Center (2017) (co-author). Reducing Greenhouse Gas Emissions from Transportation: Opportunities in the Northeast and Mid-Atlantic, Georgetown Climate Center and Cambridge Systematics (2015) (lead author).